Justin Clay Allison is a third generation racer from the famed Allison family. He is the grandson of Donnie Allison and great nephew of Bobby Allison. Justin is 21 years old and graduated from high school in 2010. He lives in Salisbury, NC with his father, Kenny and sister, Sarah. He grew up at the Allison Brothers Race Cars shop. For Justin, it all started at the young age of two and a half years old. His dad (Kenny) and uncles built him a full caged go-kart and turned him loose in the gravel parking lot at the shop. Every day at lunchtime he would race his uncle Donald. He was bound and determined not to be outrun and it was quite obvious from his performance in that gravel parking lot that Justin had the ability to become a race car driver and carry-on the Allison Legacy. Over the years, he has learned all aspects of building, working on and maintaining race cars. His greatest passion is to become a professional race car driver. He loves to hunt & fish and also other enjoys outdoor activities. Justin and his best friend took top honors representing their high school at the North Carolina state masonry competition. Justin turned down the opportunity to represent the state of North Carolina in the National masonry competition because of his dedication to his race schedule. At 5 years old Justin ran in five go-kart races. When he was 9 and 10 years old he ran in the Martinsville Charity race in December in an Allison Legacy car. It was a short fun race and he ran with Joey Logano and a couple of other guys. Justin began racing in the Allison Legacy Series in 2006. In 2006, Justin raced a limited schedule, finished in the top 5 two times and the top 10 ten times. In 2007, Justin finished 4th in points and won 1 race and finished in the top 5 eight times. In 2008, Justin finished 3rd in points and won 2 races and finished in the top 5 ten times. In 2009, Justin finished 3rd in points and won 2 races and finished in the top 5 fifteen times. In 2010, Justin won the Allison Legacy Series Points Championship. He won 7 races and finished in the top 5 twenty times in twenty one races. Justin has also won races at Rockingham Raceway Park (the half mile and the road course), Myrtle Beach Speedway, Three times at Hickory Motor Speedway, Twice at Greenville-Pickens Speedway, the Orange County Speedway, the Wake County Speedway, the Florence Motor Speedway and Tri-County Motor Speedway. Also in 2010, Justin ran his first Late Model race at Greenville-Pickens Speedway on July 2, 2010 in the PASS Super Late Model Series “Firecracker 125” in a Late Model car. He qualified 17th out of 32 cars and finished in 17th position. He finished in 11th place out of 28 cars at Newport Speedway in Tennessee on August 7, 2010 and qualified 11th for that race. He qualified 3rd at North Wilkesboro and finished in 11th place in the fall PASS race. In 2011, Justin purchased his own Late Model car. Racing in selected races in the PASS Series. He is racing October 29th at Hickory Motor Speedway in the PASS Series in the Ford Fusion Grillin’ Sauce #1. 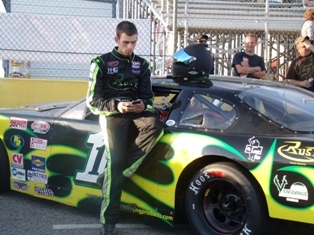 In 2012, Justin ran selected races in the PASS Super Late Model Series. 2013 brings a new sponsor to the Allison family next generation racer. RUSH RACING PRODUCTS is on board for the rest of the season. Justin will be racing in the PASS Super Late Model SOUTH Series. 2013-Justin ran an ARCA race at Kansas City Speedway. He finished in 11th place. He had a great run in the rain shortened event, running in 6th and 7th place for many laps until a long pit stop put him back out on the track in 17th position. 2014, Justin practices and readies for the DAYTONA ARCA race on February 15, 2014. He had fast runs and liked the track. Justin’s racing endeavors are organized and run through Justin Clay Motorsports, LLC, a limited liability company. His grandfather, NASCAR Legend Donnie Allison, is his personal driving coach and is at all of Justin’s races working with him on an individual basis to hone his driving skills. Note: Justin has some race driving abilities like his grandfather Donnie; some of these are determination, the ability to move smoothly and swiftly through the field and an ability to somehow miss wrecks—most of the time!